Have a theatre production this summer? We are offering a special deal for our Theatrical Rentals! 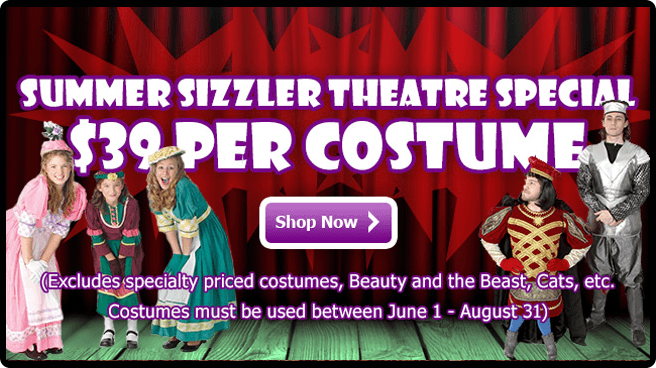 If your show falls between the June 1st and August 31st, we are offering the fantastic deal of $39/costume! This includes pulling the costume, altering the costume, and accessorizing the costume (gloves, hats, sashes, etc). Costumes excluded from this deal are specialty costumes (eg. Beauty and the Beast Objects, Cats, or Transformation costumes). Follow the link below to get more information! Contact us today for free costume plots and theatrical packets!